Product(s): Visual Studio and Visual Studio Team System. Audience(s): Developer and Technology Decision Maker. A way to deliver media experiences and rich interactive applications for the web. An intergrated approach to overcome application development challenges. included FREE parking for the event day. I registered, how about you? Personally, I like those events very much Microsoft based, Java, SAP, open source conference as well as gathering for bloggers, web developers or even web designers. Please inform me have any functions as above again! 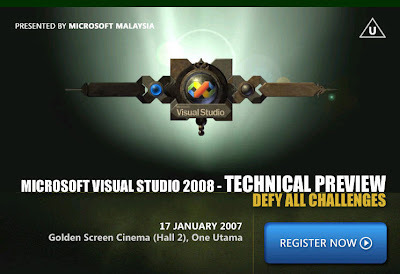 By the way, just get to know that AMBP ( All Malaysian Bloggers Project ) will have their 1st gathering on Jan 2008.